On this date in 1940 Japan’s foreign minister Yōsuke Matsuo­ka, who had grown up in Ore­gon and Cal­i­for­nia (1893–1902), in­vited the United States and other non­aligned nations to join the Tri­par­tite Pact, which Axis powers Ger­many, Italy, and Japan had ini­ti­aled in Berlin the pre­vious month (Septem­ber 27). The Pact was an out­growth of the “Rome-Berlin Axis” cele­brated by the Italo-Ger­man “Pact of Steel,” which Adolf Hitler’s foreign minis­ter Joachim von Rib­ben­trop and Benito Musso­lini’s foreign minis­ter (and son-in-law) Count Gale­azzo Ciano had signed in Ber­lin in late May 1939. The “new world order” en­vi­sioned by Tri­par­tite founding mem­bers, Matsuo­ka said, was one in which eco­no­mic bar­riers would be broken down and the natural geo­graphic divi­sions of the world estab­lished in com­ple­men­tary fash­ion to bring pros­per­ity to all peo­ples. (Article 1 of the Tri­par­tite Pact stip­u­lated that Japan “recog­nizes and respects the leader­ship of Ger­many and Italy in the estab­lish­ment of a new order in Europe.” Article 2 stip­u­lated that Ger­many and Italy “recog­nize and respect the leader­ship of Japan in the estab­lish­ment of a new order in Greater East Asia.”) Ten days after Foreign Minis­ter Matsu­oka had floated his invi­ta­tion to the U.S. and other non­aligned nations, the leader of the Pact, Hitler him­self, on a whirl­wind tour of van­quished-foe France, appealed in per­son to Spanish dic­ta­tor Fran­cisco Franco and Vichy presi­dent Marshal Philippe Pétain to join the other signa­tories. Neither did. But starting in late Novem­ber 1940, the Tri­par­tite Pact swiftly ex­panded: Hun­gary, to which Hitler had gen­er­ously given half of Roma­nia’s Tran­syl­va­nia in late August, signed up on Novem­ber 20; Roma­nia, under threat from Joseph Stalin’s Soviet Union, joined on the 23rd; and the Slo­vak Republic, formed from a por­tion of dis­mem­bered Czecho­slo­va­kia, came aboard the next day. By the time Bul­garia, recipient of Roma­nia’s southern Dobruja, joined the Tri­par­tite Pact in March 1941, the entire Bal­kans and Eastern Europe were either in treaty relation­ship with the Axis powers or, like Yugoslavia was soon to be, under Axis occu­pa­tion. Urged on by Japan, Japanese-occu­pied Thai­land and the pup­pet states of Manchu­kuo and the col­lab­o­ra­tionist “Republic of China” (led by Wang Jingwei) became unofficial signatories of the Tripartite Pact on February 15, 1942. 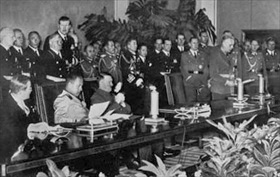 Left: On September 27, 1940, the Axis Powers (Germany and Italy) grew by one when Japa­nese ambas­sador Saburō Kurusu (left in pic­ture), Italian foreign minis­ter Galeazzo Ciano (to Kurusu’s left), and Ger­man foreign minis­ter Joachim von Rib­ben­trop (standing at podium at right) signed the three-way Tri­par­tite Pact. Adolf Hitler (slumping in chair) wit­nessed the gala pro­ceedings. Despite entering into a ten-year poli­tical and mili­tary union in 1940, Ger­many, Italy, and Japan for the most part fought sepa­rately during World War II and sur­ren­dered sepa­rately less than five years into the pact: Italy in Septem­ber 1943, Ger­many in May 1945, and Japan in Septem­ber 1945. Amer­i­cans remem­ber Kurusu as one of the Japa­nese envoys who tried to nego­ti­ate peace and under­standing with the U.S. while his coun­try was secretly pre­paring the attack on military installations at Pearl Harbor, Hawaii. 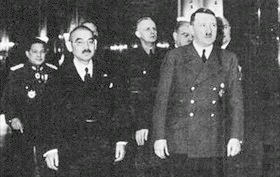 Right: Japanese foreign minis­ter Yōsuke Matsu­oka paid a visit to Hitler in Ber­lin in March 1941. In the back­ground between Matsu­oka and Hitler is Ger­man foreign minis­ter Rib­ben­trop. Matsu­oka, who in 1933 led Japan’s walk­out of the League of Nations, was a major advo­cate of Japan’s alli­ance with Ger­many and Italy, whose assis­tance he saw as a per­fect balancing force against U.S. inter­ests in the Asia Pacific region. Following Japan’s defeat in 1945, Matsu­oka was arrested by Gen. Douglas Mac­Arthur, Supreme Com­man­der of the Allied Powers, and held at Sugamo Pri­son (near Tokyo), where he died in 1946 prior to his trial on war crimes charges before the International Military Tribunal for the Far East (Tokyo Trials).